THERE is something fishy happening in the waters off Tathra. 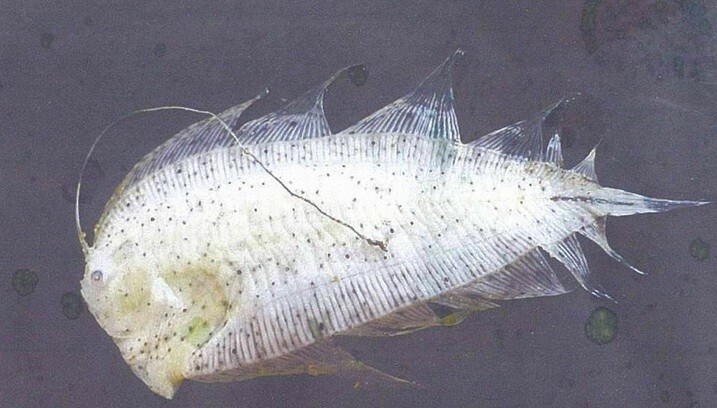 A random find on a morning stroll has sparked an international scientific mystery as a fish of unknown origins continues to leave experts baffled. Tathra local Don Cotterill became involved in this fishy tale when a friend asked him for help identifying a fish. “A mate John Chapman found this fish washed up on Tathra Beach one morning,” Mr Cotterill said. “I know a bit about fish so he asked me to have a search in my books, but I couldn’t find a match and I’d never seen anything like it. “It was pretty odd looking and about 300mm by 100mm. “My first thought was because of the fishing hook type line that naturally protrudes from near its eyes that it must be some sort of deep-sea fish. Mr Cotterill was told by marine experts at the zoo they had no idea what it was and encouraged him to send the pictures to Mark McGrouther, ichthyology collection manager at the Australian Museum in Sydney. “The first email I got back from him started with ‘Wow!’, he hadn’t seen anything like it. “He suggested a few things it might be, including a Pacific flounder, but it’s not. In May, Mr Cotterill took the specimen up to Sydney at the request of the museum. However, being up close to the specimen couldn’t assist any further with identification so Mr McGrouther took a sample for DNA, but is yet to get a match. “He also showed it to everyone he could think of and basically they were all baffled. Neither Mr Chapman nor Mr Cotterill have stumbled across another member of this strange fish’s family, but are keen to hear from anyone else who might know of other sightings of this true mystery from the deep. The mystery fish now appears listed on the Australian Museum website. “The ‘underside’ of a larval flounder found washed up on Tathra Beach, New South Wales, 28 February 2014. The long ‘filament’ is an elongate dorsal fin ray. The fish is most likely a species of Laeops. This conclusion was based on the dorsal ray count, the elongated dorsal ray and the fact that it is 9 cm in length and still has larval characteristics.